Using an aluminum pin and plastic cone system the Bag Runner is set over the pin which slides into a rail system to be moved. The ABR will lift a maximum rating of 2500 lbs made up of up to ten separate loads. 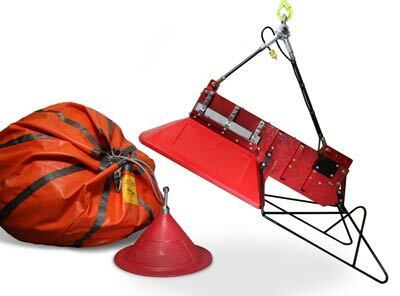 The Rupert’s Land system is the original bag running system; it has been proven in field use since 1997. Largest installed base equipment – used by more seismic companies than any other remote pickup system in North America. Designed by a pilot for pilots.